The test collection of the Visual Concept Detection and Annotation Task 2011 is now freely available here. The visual concept detection and annotation task is a multi-label classification challenge. It aims at the automatic annotation of a large number of consumer photos with multiple annotations. In all cases the participants are asked to annotate the photos of the test set with a predefined set of keywords (the concepts). This defined set of keywords allows for an automatic evaluation and comparison of the different approaches. The annotation benchmark will be performed on a fully assessed test collection similar as in the last years. The participants are asked to annotate a test set of 10,000 images with 99 visual concepts. Therefore an annotated training set of 8,000 images is provided. The evaluation will be conducted by the interpolated Average Precision and the example-based F-measure. The second challenge is a concept-based retrieval task and will be performed on a set of 200,000 images from the 1 million MIR Flickr dataset. We will pose 40 topics which consist of a logical connection of concepts from the annotation task. To give an example, we could ask to "Find all images that depict a small group of persons in a landscape scenery showing trees and a river on a sunny day." The training set of the annotation task (8,000 images annotated with 99 visual concepts) can be used to train the concept detectors. The participants are asked to submit (up to) the 1,000 most relevant photos for each topic in ranked order. The assessment will be performed in a pooling scenario using Average Precision. Eventually we may employ an inferred variant of AP. Depending on the number of submissions the pools may include just one run per group (the primary run). The participants can choose a task or participate in both. The image set is annotated with concepts that describe the scene (indoor, outdoor, landscape....), depicted objects (car, animal, person...), the representation of image content (portrait, graffiti, art), events (travel, work...) or quality issues (overexposed, underexposed, blurry...). This year a special focus is laid to the detection of sentiment concepts. We follow the approach of Russell, who defines eight affect concepts in circular order and adapted it slightly. Further, we introduce a concept "funny" which is not included in the original model. 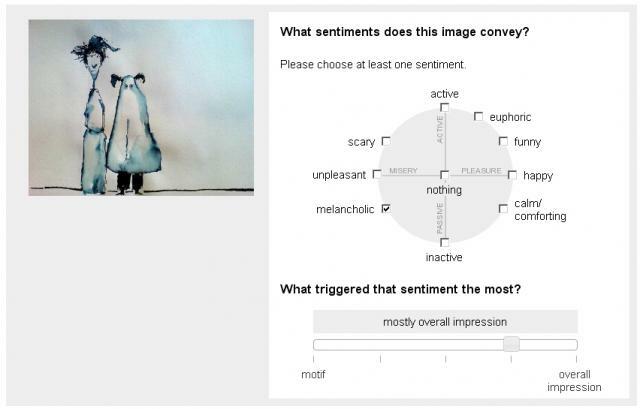 The sentiment concepts are annotated in a crowdsourcing approach by asking the turkers what sentiments are conveyed by an image. Due to the database restrictions, it is necessary to sign a user agreement to get access to the data. You can find the license agreement here. Please print it, sign it and send a scanned copy or a fax to Henning (see also the instructions page in the document). The task uses a subset of the MIR Flickr 1 million image dataset for the annotation challenge. The MIR Flickr collection supplies all original tag data provided by the Flickr users (further denoted as Flickr user tags). These Flickr user tags are made available for the textual and multi-modal approaches. For most of the photos the EXIF data is included and may be used. The annotations are provided as plain txt files. The training set for the annotation task is now available! It consists of 8,000 photos annotated with 99 visual concepts , the Photo Tagging Ontology, EXIF data and Flickr user tags. Further we extracted basic RGB SIFT features with dense sampling and standard parameters in text format using the Color Descriptor Software from the University of Amsterdam. (Command: ./colorDescriptor image.jpg --detector densesampling --descriptor rgbsift --output output.txt) For further information on the format or other colour descriptors please have a look at the ReadMe. The same features will be provided for the testset of the annotation task. The training set including metadata can be downloaded here. The features can be downloaded here. DOWNLOAD only for registered participants who signed the license agreement. The login and password are listed in the "Detail" view of the collection in the ImageCLEF registration system. The test set for the annotation task is now available. It consists of 10,000 photos with EXIF data and Flickr user tags. The test set including metadata can be downloaded here. The dataset for the concept-based Retrieval Task consists of the 200,000 Flickr images stored in images2.tar and images3.tar of the 1 Million Flickr Set. Please see the instructions on how to download the data. The data is available here and here. The exif data can be found here and here. The Flickr user tags are available here and here. Please note that you are allowed to use the training set of the annotation task to train the concept detector for the retrieval task. The topics for the concept-based retrieval task are based on the Wikipedia task topics from 2009-2011 and adapted to the characteristics of the collection. The wikipedia topics were developed by using query logs and involving participants in the definition. Please have a look at the description of the wikipedia task for more information on topic development. The topics can now be downloaded here. Participants may submit up to 5 runs for the photo annotation task and up to 10 runs for the concept-based retrieval task. Participation in one or both tasks are possible. Please note that it is essential to denote the primary run for the concept-based retrieval task. This run will definitely contribute to the pool in relevance assessment. The submission system will open by 13.05.2011. The submission format is equal to the annotation format of the training data, except that you are expected to give some confidence scores for each concept to be present or absent. That means, you have to submit a file containing the same number of columns, but each number can be an arbitrary floating point number between 0 and 1 , where higher numbers denote higher confidence in the presence of a particular concept. Please submit your results in one txt file for all results. For the example-based evaluation measure, we need a binary mapping of the confidence scores to 0 or 1. Please append binary annotations for all concepts and images below the confidence values. The submission system performs automatic checks if the submission file is correct. In case not, you will get an error message during upload. Please note that we restrict the number of runs per group to maximal 5 submissions. Submission follows the standard TREC format. For each topic, (up to) the 1000 most relevant images should be submitted. A *space* is used as delimiter between columns. Each run includes the answers for all topics. Different runs are uploaded in separate files. (2) The second column is not used in ImageCLEF 2011 and should be set to 1. (3) The third column is the official image id of the retrieved image. In our case it equals the filename of the image. (4) The fourth column is the rank position (**starting from 0**). (5) The fifth column shows the score (integer or floating point) that generated the ranking. This score MUST be in descending (non-increasing) order and is important to include so that we can handle tied scores (for a given run) in a uniform fashion (the evaluation routines rank documents from these scores, not from your ranks). (6) The sixth column is called the "run tag" and should be a unique identifier for your group AND for the method used. That is, each run should have a different tag that identifies the group and the method that produced the run. The results for the Photo Annotation Task 2011 are now available. We had submissions of 18 groups with altogether 79 runs. In total there were 46 submissions which only use visual information, 8 submissions which only use textual information and 25 submissions utilising multi-modal approaches. We applied three measures to determine the quality of the annotations. One for the evaluation per concept and two for the evaluation per photo. The evaluation per concept was performed with the Mean interpolated Average Precision (MAP). The evaluation per example was performed with the example-based F-Measure (F-ex) and the Semantic R-Precision (SR-Precision). For the evaluation per concept the provided confidence annotation scores were used, while the evaluation per example considered the binary annotation scores (F-ex) and the ranked predictions (SR-Precision). The evaluation script for the interpolated AP can be found here. The results for the concept-based retrieval task are now available. In total, 4 groups participated with 31 runs. 7 runs have been submitted in the textual configuration, 14 runs use only visual information, and 10 runs consider multi-modal information. Further, the 31 runs can be splitted into 15 runs that consider manual input and 16 runs that are completely automated. The runs denoted with "manual" use a manual intervention to construct the query out of the narrative of the topics, e.g. by deriving a boolean connection of concepts. After query formulation these runs also retrieve images in an automated manner. The result table can be found here. 13.06.2011: submission of runs --> extension to 19.06.2011! 19.09.2011-22.09.2011: CLEF 2010 Conference, Amsterdam, The Netherlands.